Friday means my guitar lesson - I'll Find My Way Home, Vangellis - a mooch around the charity shops and lunch in our favourite cafe - chocolate ice cream, sometimes we coma away empty handed but today we did rather well. Turquoise serving platter 50p, Cherry Tree by Midwinter bowl 99p, very Orla or actually the other way around. JAJ bowl £1, addicted to this stuff, oven, freezer, dishwasher and dirt cheap. 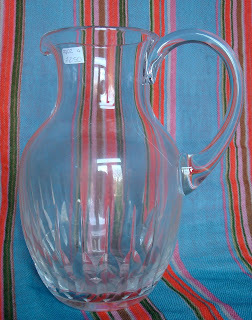 Crystal jug, weighs a tonne, £2.50. Hand embroidered - can't stop myself - linen tablecloth £2.50. Blue Bird - fab illustrations, way before Lauren Child - 75p, tin bucket £1 and a cafetiere £2.50. So for £11.74 we didn't do bad. Last weeks charity purchase an original home office, fold down to a small cupboard, £55. The vintage Tipp-Ex was no extra charge.